It turns out there may have been a reason other than true love for Safaree Samuels to put a ring on his beloved’s finger so quickly. 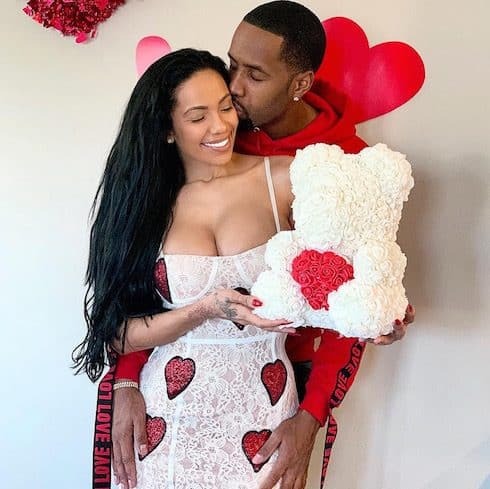 Is Erica Mena pregnant with Safaree’s baby — and is she planning on sharing the news for Love & Hip Hop Atlanta‘s cameras? Based on the latest social media tease from the couple, Erica may indeed be with child, and the gossip over her maybe-baby bump is flying fast and furious. All of which is to simply say that the two Love & Hip Hop co-stars and recent lovebirds have related, if different, professional reasons for wanting to make a baby together. As for their personal reasons? No one’s really doubting that Erica and Safaree are into each other; they looked well boo’d up and happy together in the weeks before Safaree’s Christmas Eve proposal. #PressPlay: #Safaree previews some new music with #EricaMena by his side ??? Personally? That looks more like a poorly placed tennis ball than a baby bump. Erica also doesn’t seem to want to move too much, maybe suggesting that whatever she’s got under her sweatshirt to simulate a baby bump would fall out if she really got into the song. I know all women show differently, but, based on that video alone, Erica has more in common with Blac Chyna’s eating habits than she does Lyrica’s timing. If Erica Mena is pregnant, and she does reveal her pregnancy during Love & Hip Hop Atlanta Season 8, it would be the show’s second high-profile cast pregnancy in as many seasons. Last year, Starcasm was the first to report Jessica Dime’s pregnancy, which the show confirmed shortly thereafter. LHHATL Season 8 is filming now. The show is reportedly set to return on March 25.